Place your plants directly into Nature’s Yield Outdoor Planting Mix and water in. Plant at a depth according to instructions provided by your local nursery, or information on identification tag. There is no need to mix any other soils with this mix. Simply plant directly in the soil, and water. When planting or transplanting trees and shrubs after the dirt has been removed from the desired planting location, place Nature’s Yield Outdoor Planter Mix in the bottom of the hole to a 2 inch depth. Place your tree or shrub in the prepared area. Water according to instructions provided on identification tag, or according to nursery professional. More flowers. More fruit. More vegetables. Available in 1.5 cu ft size. 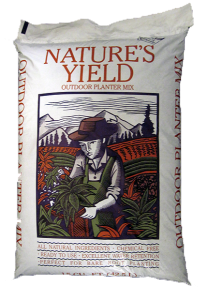 Nature’s Yield Outdoor Planting Mix is 100% organic. Nature’s Yield Outdoor Planting Mix is blended with spaghnum peat moss for added moisture retention. Nature’s Yield Outdoor Planting Mix is Nature’s Yield Compost based. You receive all of the beneficial nutrients, and micro-organisms associated with Nature’s Yield Compost, which will assist in growing healthier plants. Nature’s Yield Outdoor Planting Mix is used by professional growers along the Colorado Front Range, and is sold exclusively by member dealers of Garden Centers of Colorado.